As an official club partner of one of the best known names in world rugby, the award-winning Warwickshire brewery has honoured the club’s major milestone with a strong Rye IPA, aged for 6 months in Bourbon Casks. 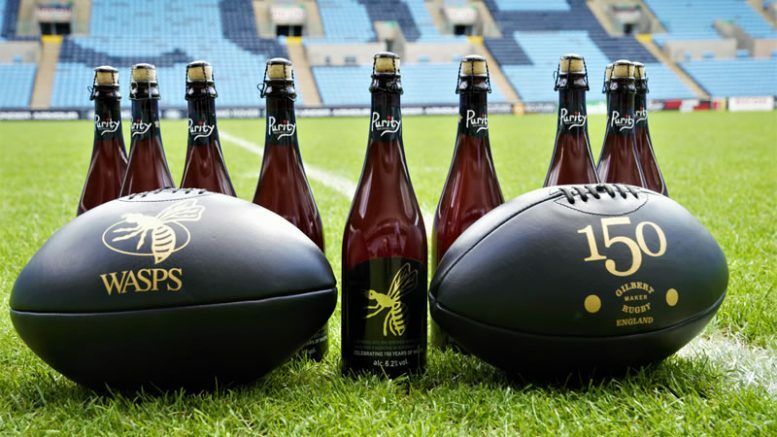 Only 150 bottles of the beer have been exclusively produced for Wasps Rugby. The 6.2% limited edition beer is available in 750ml bottles, brewed with champion malts, Maris Otter, Rye, Crystal Rye and Cara malts to create a warming copper orange colour, and hopped with Pilgrim, Chinook, Galaxy and Simcoe to create a lingering floral bitterness. Brewed with skill, dedication and passion, this honorary beer is the latest addition to a year of celebrations as Wasps Rugby continues to push for the playoffs in the Aviva Premiership and look to a final at Twickenham, the home of English Rugby, and truly make this 150th season one to remember. Playing their homes games at Coventry’s Ricoh Arena, Wasps’ proud history began in 1867. They have since been crowned European Champions twice and English Champions five times, three of which were in consecutive years (2003, 2004, 2005).